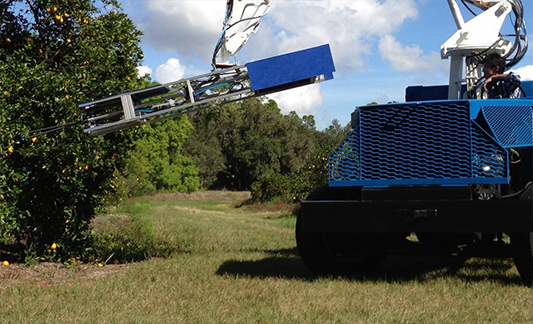 Energid has developed a robotic citrus harvesting system with costs comparable to that of human labor. To achieve this, it uses multiple low-cost picking mechanisms organized into a grid. The gridded picking mechanisms are simple, with two degrees of freedom each for aiming and one degree of freedom in extension. The extending parts of the picking mechanisms have no actuators and no sensors, making them robust, easy to manufacture, and easy to replace. Organizing the picking mechanisms into a grid allows the cameras used to locate fruit for picking to be organized into an integrated grid rigidly attached to the supporting structure. A two-mechanism, six-camera, system in Energid’s lab is shown below. This system is steered using electrical motors (two per picking mechanism) and extended using pneumatics. It was tested in a Florida orange grove using a portable generator and air compressor. For field testing, the picking system was mounted on a four-axis hydraulic arm mounted on a diesel truck. This is shown below. The hydraulic arm allowed an operator to move the picker through a scanning motion over the surface of citrus trees, while the picking system automatically found and removed the oranges in the area that could be seen by the cameras. This is shown below for a Valencia orange grove. These results have been achieved with picking mechanisms that cost less than $10 to construct, giving an economical path forward for machine harvesting of citrus. Download the Actin Data Sheet! 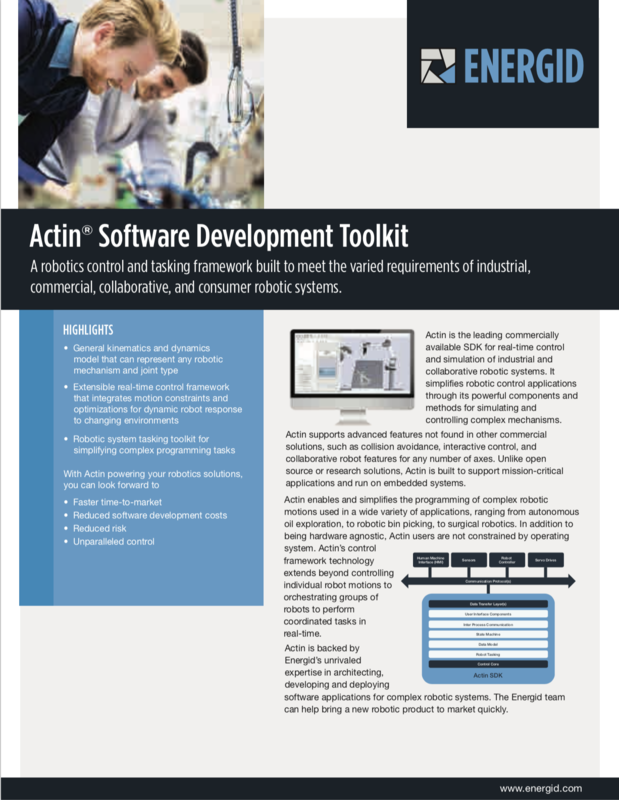 Would you like to learn more about leveraging Actin in your application? Contact us for a free consultation and demo.